In the issue 4 of the mag we've got a feature on the classic Albam Fisherman's Cagoule. Below is a full transcript of the interview we did for the piece. Some of the info is now out of date, but it's a good interview about a piece we love. What was the thinking behind the coat? We wanted to make something simple, lightweight and a little bit of fun. It isn't a technical piece, doesn't have any bells and whistles but strikes a chord of familiarity with wearers. How some clothes in the wardrobe should be. When did it come out? How much was it? It was the first style of outerwear for our Beak Street store opening in 2007. It was £160, a hefty price tag for us at the time. With the rising cost of everything at the moment, it seems like a mythical price! Although it is a Fisherman’s Cagoule, it wasn't designed with this as a reference at all. The similarities came after the sample had been made and the fact it was produced in millerain silicone-proofed cotton. Some things stick in the psyche and maybe the Fisherman was one of these, but we just combined simple workwear jacket styling with a three-piece hood and panelled sleeves. The white buttons actually mark the third production of the cagoule. It was released in two colourways in 2007: navy (with white buttons) and burnt orange (with black buttons). The white buttons consolidated the style and combined the white binding which was then becoming one of the Albam signatures within a garment. 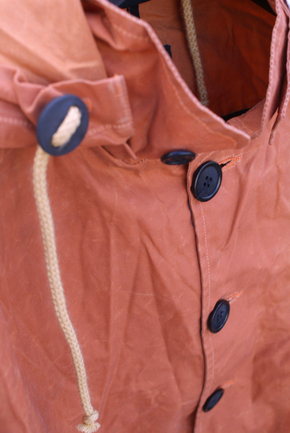 But for those who have the very first cagoule we did, it is the burnt orange-with-black binding and buttons. Did it bring people into the shop who'd never been in before? What sort of people? It was style we put in our first store so every person that came in was new. We were developing a customer base that's now diverse and maybe the piece encouraged this diversity. Casuals picked up on it quickly, but so did designers and Ad agency creatives in the Soho area of London. It grew from there. What copies did you see after? There are a number of styles that came out afterwards. Whether that was a result of us, or just something that's in the air I’m not sure, but there are some close similarities! Are you going to re-release it? This is something that we have talked about for the last two/three years since we stopped the style in 2008/2009. Over time we’ve developed a number of archive pieces that never went into production – cagoules with small modifications, different fabrics, different fastenings but all based on the Albam Cagoule principle. These are going to be released as one-offs around August* from our first store on Beak Street. We hope we’ll get a number of the original wearers down there just to see how things have changed and see some friendly faces from when we started. If anybody wants to come along email us to be put on the guestlist. This article first appeared in Umbrella Magazine Issue #4. You can view it online here.